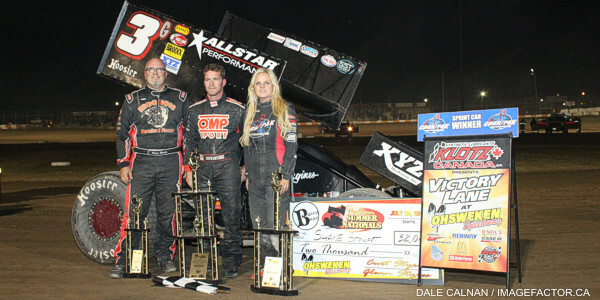 by Tommy Goudge (July 30, 2013) – 70 drivers signed in to race on World of Outlaws Sprint Car series “Six Nations Showdown” night presented by Arrow Express at Ohsweken Speedway on Tuesday. 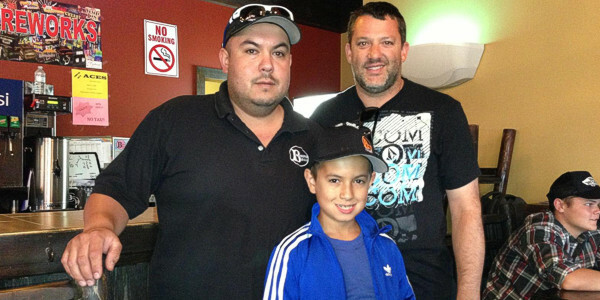 Donny Schatz and Karl Sault visited Klotz Canada Synthetic Lubricants Victory Lane. A huge crowd watched Jason Sides and Donny Schatz start on the front row of the 30 lap World of Outlaws feature event, and . The first lap wasn’t complete when Cody Darrah’s car suffered front end damage to bring out the only yellow flag of the race. Sides took the lead when the race restarted, and set off in search of his 4th Ohsweken win in 7 tries, but Schatz stayed close to Sides, and made the winning pass with 11 laps complete. Schatz built a sizeable lead, lost part of it in traffic, and then built it to almost 7 seconds by the time the checkered flag fell. 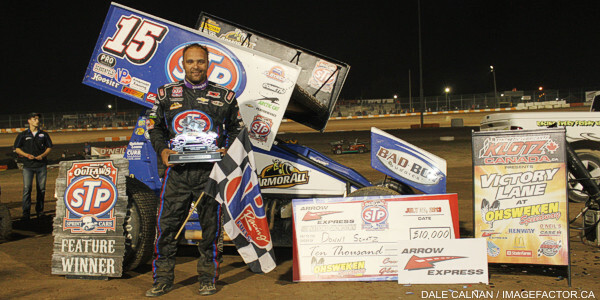 The win was Donny Schatz’s 2nd at Ohsweken Speedway, while Chad Kemenah raced to the runner-up spot, followed by Daryn Pittman, Jason Sides, and Tony Stewart. Donny Schatz, Craig Dollansky, and Chad Kemenah won the heat races, while Tom Huppunen was the winner of the B-Main, Jason Sides won the Dash race, and Paul McMahan was fastest in time trials with a lap of 13.002 seconds. Shaun Quinn and Brett Rodwell were on the front row for the 25 lap Thunder Stock feature, and Quinn led early before giving way to Rodwell, who led 1 lap before Rob Murray got to the front from his row 10 starting position. Murray had problems and fell back while Aaron Turkey took over, but Karl Sault tracked Turkey down and led the second half of the event to get the feature win. Ryan Turner, Wyatt Van Wart, Pete Reid, and Jim Lampman chased Sault to the finish line. Heat races for the 39 car field were claimed by Shaun Quinn, Trevor DeBoer, Karl Sault, and Mike Thorne, while Lee Winger won the B-Main. *No racing will take place at Ohsweken Speedway on Friday, August 2*. The Rochester Knighthawks Lacrosse Club presents Art Hill Memorial Night at Ohsweken next Friday, August 9, featuring the Corr/Pak Merchandising Sprints, Affordable Towing & Recovery Thunder Stocks, HRW Automotive Mini Stocks “Art Hill Memorial 42”, and Gale’s Auto Aftermarket Bombers. Spectator grandstands open at 6:00pm, with racing starting at 7:30pm on Friday, August 9! 1. 51 Paul McMahan (Elk Grove, CA) 13.002, 2. 14 Tony Stewart (Rushville, IN) 13.096, 3. 1 Sammy Swindell (Germantown, TN) 13.130, 4. 71m Joey Saldana (Brownsburg, IN) 13.145, 5. 49 Todd Hoddick (Cheektowaga, NY) 13.163, 6. 1z Jessica Zemken (Sprakers, NY) 13.189, 7. 15 Donny Schatz (Minot, ND) 13.208, 8. 11 Steve Kinser (Bloomington, IN) 13.208, 9. 63 Chad Kemenah (Findlay, OH) 13.258, 10. 7s Jason Sides (Bartlett, TN) 13.267, 11. 7 Craig Dollansky (Elk River, MN) 13.297, 12. 9 Daryn Pittman (Owasso, OK) 13.335, 13. 11k Kraig Kinser (Bloomington, IN) 13.352, 14. 6 David Gravel (Watertown, CT) 13.438, 15. 3g Shane Stewart (Pittsboro, IN) 13.446, 16. 29 Kerry Madsen (Saint Marys, NSW, Australia) 13.452, 17. 4 Cody Darrah (Red Lion, PA) 13.530, 18. 0 Glenn Styres (Ohsweken) 13.580, 19. 27h Tom Huppunen (Fenwick) 13.733, 20. f37 Kyle Moffit (South Dayton, NY) 13.755, 21. 7x Jamie Collard (Burford) 13.947, 22. 07x Dain Naida (Tecumseh, MI) 13.953, 23. 30g Steve Goldner (Aylmer) 14.177, 24. 5 Keith Dempster (Alton) 14.199, 25. 3r Shane Ross (Thedford) 14.267, 26. 01 Mikey Kruchka (Hamilton) 14.361, 27. 15aw April Wilson (Joyceville) 14.379, 28. 10 Mitch Brown (Brantford) 14.383, 29. 80 Chris Steele (Fenwick) 14.526, 30. 94 Stan Zanchin (Fort Erie) 14.633, 31. 5c Conor Mahoney (Waterdown) 14.677. 1. 15 Donny Schatz (2), 2. 7s Jason Sides (1), 3. 29 Kerry Madsen (6), 4. 51 Paul McMahan (4), 5. 71m Joey Saldana (3), 6. 11k Kraig Kinser (5), 7. 07x Dain Naida (8), 8. 27h Tom Huppunen (7), 9. 10 Mitch Brown (10), 10. 3r Shane Ross (9), 11. 5c Conor Mahoney (11). Time – 1:48.828. 1. 7 Craig Dollansky (1), 2. 11 Steve Kinser (2), 3. 14 Tony Stewart (4), 4. 4 Cody Darrah (6), 5. 6 David Gravel (5), 6. 49 Todd Hoddick (3), 7. f37 Kyle Moffit (7), 8. 01 Mikey Kruchka (9), 9. 80 Chris Steele (10), 10. 30g Steve Goldner (8). Time – 1:51.219. 1. 63 Chad Kemenah (2), 2. 9 Daryn Pittman (1), 3. 3g Shane Stewart (5), 4. 1z Jessica Zemken (3), 5. 1 Sammy Swindell (4), 6. 7x Jamie Collard (7), 7. 94 Stan Zanchin (10), 8. 15aw April Wilson (9), DNF. 0 Glenn Styres (6), DNF. 5 Keith Dempster (8). No Time. 1. 27h Tom Huppunen (2), 2. 0 Glenn Styres (1), 3. 07x Dain Naida (4), 4. 01 Mikey Kruchka (8), 5. 80 Chris Steele (11), 6. 5 Keith Dempster (6), 7. 3r Shane Ross (7) 8. 10 Mitch Brown (10), 9. 94 Stan Zanchin (12), 10. f37 Kyle Moffit (3), 11. 5c Conor Mahoney (13), DNF. 15am April Wilson (9), DNS. 30g Steve Goldner (5). No Time. 1. 7s Jason Sides (1), 2. 15 Donny Schatz (4), 3. 63 Chad Kemenah (2), 4. 51 Paul McMahan (8), 5. 11 Steve Kinser (3), 6. 14 Tony Stewart (7), 7. 9 Daryn Pittman (10), 8. 1 Sammy Swindell (6), 9. 71m Joey Saldana (5), 10. 7 Craig Dollansky (9). Time – 1:21.383. 1. 119 Shaun Quinn (Caledonia), 2. 4k Kevin Knapp (Thorold), 3. 68 Aaron Turkey (Ohsweken), 4. 77 Brett Rodwell (Caledonia), 5. 00 Robbie General (Ohsweken), 6. 777x Steve Hess (Ohsweken), 7. 17 Rob Disher (Grimsby), 8. 4 Dale Gyokery (Jarvis), 9. 911 Nick Liverance (Brantford), DNF. 48 Mike Graham (Caledonia). No Time. 1. 23 Trevor DeBoer (Caledonia), 2. 38 Terry Martin (Ohsweken), 3. 10 Jake Brown (Brantford), 4. 12 Brad Herron (Waterford), 5. 84rk Ryan Beagle (Vittoria), 6. 19 Cory Turner (Caistor Centre), 7. 44 Kevin Dawson (Caledonia), 8. 31 Dave Bailey (Hagersville), 9. 1j Jason Fontaine (Port Colborne), DNF. 00x Derek Miller (Ohsweken). Time – 2:47.910. 1. 81 Karl Sault (Dundas), 2. 28 Jim Lampman (Caistor Centre), 3. 11r Bryce Richardson (Port Colborne), 4. 85b Ryan Dinning (Caledonia), 5. 91 Ryan Turner (Caistor Centre), 6. 2 Lee Winger (Caledonia), 7. 711 Paul Reichel (Ridgeway), 8. 93 Melissa Miller (Ohsweken), 9. 13 Kacey Huffman (Hamilton), DNF. 73 Mike Miller (Cayuga). No Time. 1. 55 Mike Thorne (Caledonia), 2. 9 Dave Silverthorn, Jr. (London), 3. 33 Jack Myers (Wainfleet), 4. m1 Rob Murray (St. Catharines), 5. 04 Wyatt Van Wart (Cambridge), 6. 1 Chris Dickie (Brantford), 7. 32 Mark Fawcett (Canfield), 8. 05 Pete Reid (Niagara Falls), 9. 85hs Curt Styres (Ohsweken). Time – 2:43.192. 1. 2 Lee Winger, 2. 05 Pete Reid, 3. 1 Chris Dickie, 4. 44 Kevin Dawson, 5. 711 Paul Reichel, 6. 19 Cory Turner, 7. 85hs Curt Styres, 8. 777x Steve Hess, 9. 93 Melissa Miller, 10. 911 Nick Liverance, 11. 31 Mike Miller, DNF. 00x Derek Miller, DNF. 17 Rob Disher, DNF. 4 Dale Gyokery, DNF. 32 Mark Fawcett, DNF. 48 Mike Graham, DNS. 73 Dave Bailey, DNS. 13 Kacey Huffman, DNS. 1j Jason Fontaine. No Time.